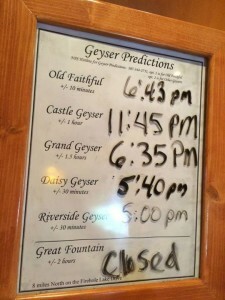 Old Faithful Geyser – #1 Attraction at Yellowstone? The first thing we did when we got to Yellowstone National Park was go to the Madison Visitor Center to ask about Old Faithful’s schedule. Yes, there’s a schedule. It turns out we just missed an eruption. 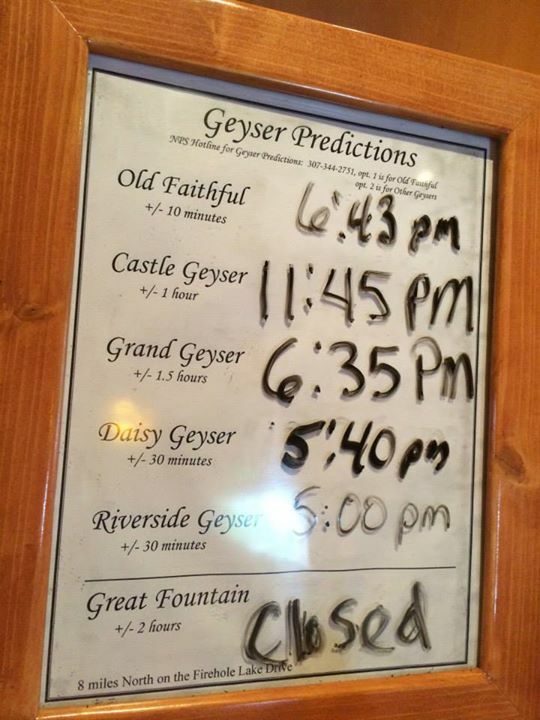 We decided to go on with our day and see all the other geyser activity in the area, and then save the best for last. It took us about eight hours to cover the whole area from Madison to Old Faithful – we stopped at every single geyser basin and pullout area. By the time we got to Old Faithful Geyser we were very tired, but feeling very satisfied with our day so far, and were looking forward to the icing on the cake. 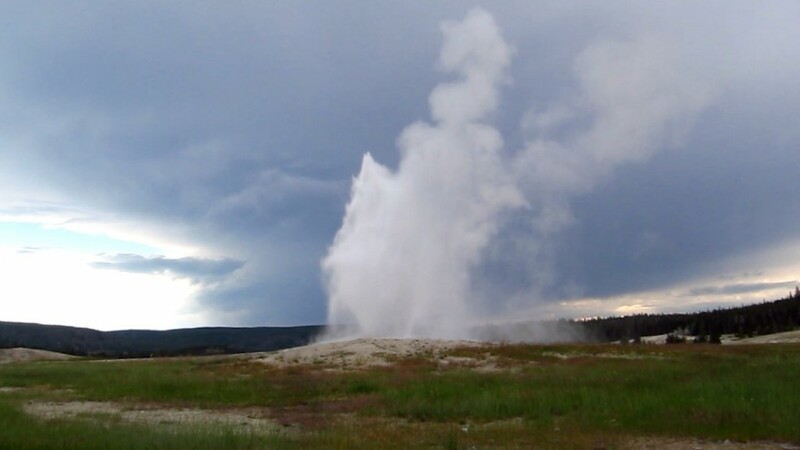 We checked the schedule again and saw that Old Faithful was going to erupt in about 45 minutes. The viewing area was still very empty but we had to keep an eye on it because we wanted front row seats to the show. Well, what do we do for 45 minutes? We washed our faces (this was very much needed!) and decided to get some food. The food at the cafeteria at Old Faithful Lodge looked really unappetizing and kinda pricey for looking so blah, but there was an ice cream booth to the left of the cafeteria. Bingo! We got huge scoops of Huckleberry soft serve ice cream in a sugar cone and went to sit down at the viewing platform. Right in the center. Awesome! As we were eating our ice cream, resting our tired legs, and talking about the awesome things we saw earlier that day, the viewing area really started filling up. Definitely plan on getting there at least a half hour before the scheduled eruption if you want to be in the front and don’t want people’s backs in your picture. Now, was it so amazing that it deserves to be the #1 attraction in the park? It’s hard to say. If this was the first geyser that we saw, then yes, it would have been the most amazing thing EVER. But since we spent the last eight hours looking at other geysers of all shapes and sizes, this one felt like just another geyser to us. However, it was definitely the biggest one we saw. And it is amazing that it really erupts faithfully on time. I feel like we definitely planned our day right. Watching Old Faithful Geyser erupt while resting after a long adventurous day and eating local Huckleberry ice cream is definitely the way to do it! However, if you have only a couple of days in the park and the eruption times don’t fit in with your plans, I would say to skip this one and go see all the other amazing thermal activity in the park. There are amazing geysers and spectacular colorful thermal pools in the Norris area that you can experience much closer than the Old Faithful Geyser.